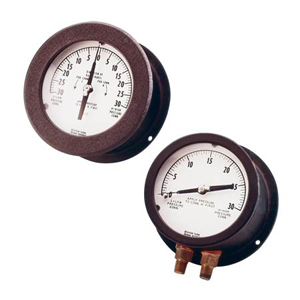 OMEGA’s PGD Series differential pressure gauges are rugged industrial gauges which indicate the difference between two input connections. Differential ranges provide the maximum resolution for applications where one input is always at a higher pressure than the other. In cases where one input can be higher or lower than the other, a bi-directional differential range should be used. The PGD Series is constructed with two independent Bourdon tubes. The opposing Bourdon tubes are linked to a single pinion gear which rotates a pointer for direct pressure readings. By using two independent Bourdon tubes, the gauge can handle liquids or gases on either or both ports. The large 4½" dial makes reading pressure easy. Each gauge is equipped with a micrometer adjustment for rezeroing the gauge. Gauges are available with ports located in the lower (six o’clock) position or in the rear for panel mounting.